Caught wind of this band based on a recommendation by another Huntsville-area musician, Judson Charles Law. What was once a wind has blossomed into a full-blown Alabama mobile-home chompin’ tornado. If memory serves, he used the words “Replacements” and “Springsteen” as reference anchors for the band. At that point, my eyes glazed over, and everything took on the appearance of the backdrop of the Twilight Zone movie freakouts. And to the benefit of Mr. Law, full credence is due to his ascertainment. I have gone very few days in the last two months not spinning this record. I have listened to it on days when I was telling myself “not Nato Coles again. Find something else. Anything.” And like any female protagonist in almost every romantic comedy produced in the last thirty years, I kept returning, powerless to its charms, to my renegade, maverick romantic interest, Nato Coles (& The Blue Diamond Band, where noted). 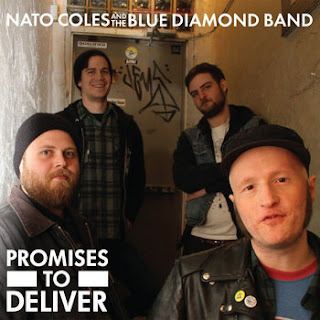 In a nutshell, Nato Coles is the early sector of Bruce Springsteen's career (up to and including Born In The U.S.A.) if maybe it had been prescribed some type of anti-depressant instead. The blue-collar, heart-on-the-sleeve raw honesty and emotion is there, the street-level perspective intact, but it ends up leaving one with the feeling of excitement at the prospect of a bold, cross-country adventure, rather than the urge to go commit suicide at the nearest railyard on the cloudiest day of the year. There are also touches of Ryan Adams, Jeremy Porter And The Tucos, Lucero, etc. It’s self-aware and introspective and self-examinate enough to provide sustenance to the soul, nutrition to the spirit, but is enough fun to be able to put on and mindlessly bullet down the highway en route to a destination free of the bridles that attach themselves to creature comforts we all seem to need to make the modern human condition sufferable.